Bosnia and Herzegovina is a small country in Europe, in the Balkan Peninsula, to be more precise. It was a part of the former Yugoslavia, but it gained its independence in 1992. Most of its surface area is covered by mountains, and the country has a small access point to the Adriatic sea. Tourism is on the rise in Bosnia and Herzegovina, and there are plenty of wonderful places to visit. It has impressive old ruins and castles, and if you want to spend a day at the beach, the Adriatic Sea is very warm and welcoming. When it comes to visas, what you need to know is that Bosnia and Herzegovina is an applicant to become a member state of the European Union. As a result, the visa policy of Bosnia and Herzegovina has many similarities with the visa policy of the Schengen Area. Consequently, all nationalities who enjoy the freedom of movement that EU provides can enter Bosnia and Herzegovina as well. The list also includes states outside the Union, which brings us to a total of 101 countries and jurisdictions whose nationals can enter Bosnia and Herzegovina without a visa. They can stay up to 90 days within a 180-day period. If you want to know under which category of travelers you fall, you can use the tool we designed to tell you precisely that in just a second. In the top right corner, you will notice a button that says Visa Checker. Click on it, choose your country of origin from the drag-down menu, and select Bosnia and Herzegovina as your destination. If you do not need a visa, you can book your flight. If you do, however, we provide a list of embassies you can go to and submit an application. We regret to inform you that we do not process Bosnia and Herzegovina visa applications. We plan to, but until then, we wish to be of as much help as we can possibly be. For that reason, our support service is at your disposal 24/7. The service is free of charge, and our consultants are ready to answer any question you may have. As far as the requirements go, our advice is that you should call the diplomatic mission or embassy and ask them before you take a trip there. 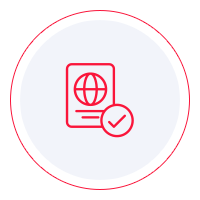 The contact information should be with the list of embassies provided by our Visa Checker. While the information you find online is vast, it is not the most reliable. We think that you should use it as a reference only. What we can tell you is that you need a passport that remains valid for at least another 3 months from your date of departure from Bosnia and Herzegovina. Also, the document must have enough blank pages. While we cannot expedite the visa application for you, it is our biggest wish that you find the information above helpful. We assure you that once we receive requests for Bosnia and Herzegovina, we will make your visa application process as smooth as possible.